The latest Scottish workforce statistics show a further loss of jobs in the last year. However, it's worth looking at the numbers over a longer time span to analyse the impact since the financial crash and subsequent recession. This facilitates a view of the overall impact of austerity economics on public sector employment. In the third quarter of 2012 there were 552,100 people employed in the public sector in Scotland (581,300 including financial institutions), 22.3% of the total workforce. That’s a decrease of 8,700 (1.5%) since Q3 2011. However, if we go back to the public sector employment high point in 2008/9, we can see that a staggering 51,700 jobs have been lost in the Scottish public sector. There is no real difference between reserved and devolved employment. Total employment in the devolved public sector has decreased from 491,700 in Q3 2011 to 486,000 in Q3 2012. That’s a cut of 5,700 (1.2%) over the year and 40,000 jobs lost since 2008. When we dig a little deeper into these numbers it is clear than jobs have not been cut evenly across all sectors. The decrease in employment in the devolved public sector has been driven by a cut in local government employment. Council jobs decreased by 5,300 (1.9%) over the last year and 34,500 jobs have been lost in local government since the 2008 high point. Local government makes up 57.3% of workforce, but has taken 66.7% of the workforce cuts. Similarly, employment in further education colleges decreased by 900 (6%) in the last year and 2700 jobs have been lost since 2008/9. Overall, there has been a 6.7% cut in devolved jobs since the 2008/9 high point. However, the local government workforce has been cut by 11% and FE colleges by 16%. This confirms the view that councils, colleges and their workers have taken the brunt of the cuts. This reflects the Scottish Government’s priorities for cuts. Why does this matter? Well for a starter public services are largely delivered by staff - less staff mean fewer and poorer services. But it also has a wider economic impact. On the Treasury model 51,000 public sector job losses results in around 52,000 private sector job losses. This has been masked to a degree by underemployment, an issue I am pleased in see the Scottish Parliament Economy Committee is investigating in the New Year. The wider impact on communities is also explained in UNISON’s Public Works campaign and in the STUC Better Way materials. I would also recommend Brian Ashcroft’s analysis at Scottish Economy Watch. He often digs below the surface of the raw data to explain the wider impact on the economy of job losses. The main impact of these job losses has been poorer public services and a longer and deeper recession. Another example of how austerity economics is damaging Scotland. But it also tells the tale of Scottish Government priorities when implementing the ConDem cuts. I was interviewed on Good Morning Ulster this morning on the issue of rising numbers of race crimes in Scotland, and in particular, that more than one in three victims are white. The question from Ulster was, 'has Scotland become a cold place for migrants'. They were particularly interested in the increase in racist crime against English people. UNISON Scotland's role in anti-racism campaigns was the reason for my appearance - although the fact that I was born in England, added some human interest! It is certainly the case that the number of recorded incidents against what are classified as 'White British' has been steadily rising. From 826 in 2004/5 to 1295 in 2011/12. There was also a big 22% increase in the last year. This is obviously a cause for concern as reflected in political reaction to the figures. Others, including the Equality and Human Rights Commission, have urged further analysis of the data to identify any underlying issues and I would agree with that. Having said that, I don't think we should over exaggerate the position. Scotland has not suddenly become a dangerous place for those born in England. The numbers are small in relation to the numbers of English people living in Scotland. The English are Scotland's largest minority at over 400,000. Of course nearly twice that number of Scots live in England. I believe we should be more concerned about the increase in racist crime against Scottish Gypsy Travellers. This number has increased from 130 in 2004/5 to 700 in 2011/12. This is one of the reasons for UNISON Scotland's guidance booklet published earlier this year. The most common crimes were racially aggravated conduct - this means the racism is part of another crime. So there may be a link to law enforcement. However, we should recognise that these figures are the tip of the iceberg as race crime is always under recorded. Increasing numbers can be seen as a positive development, showing a greater willingness to report. I was asked if I thought these numbers might be linked to a sense of increasing 'Scottishness' or the independence referendum. Extreme nationalism is rare in Scotland and the far right vote in Scotland is the lowest in Great Britain - despite the economic recession. The SNP's civic nationalism does contribute to that positive approach and successive Scottish governments have actively encouraged immigration. It is essential to growing the economy and to address demographic change with our ageing population and low birth rate. So to return to the initial question. I don't believe these statistics represent any 'coldness' towards people who were not born in Scotland. Clearly racism and sectarianism is an issue in Scotland that needs to be addressed and there are a range of initiatives. However, the traditional Scottish values of hospitality remain strong and that has been my personal experience over 22 years. I won't be packing my bags anytime soon! I was in Parliament today giving evidence to the Finance Committee on the consequences of demographic change. It is clear that Scotland faces an increase in the number of older people in Scotland in the future, which will in turn create pressures on public finances. The population aged 65 and over will increase by 21% from 2010 to 2016 and 62% by 2031 and that for those aged over 85 there will be an increase in the population by 38% by 2016 and 144% by 2031. This is usually announced as bad news, but I argued today that there are positives. Many older people are living healthier lives to a greater age which will decrease the number of years that they require care. Older people, particularly those with good pensions, have a huge spending power and businesses and policy makers should recognise the needs of ageing consumers. They also make a productive contribution through caring and volunteering in various settings and, since the abolition of the Default Retirement Age many of them are continuing to work well beyond the previous norm of 65. Scotland's population is also rising thanks mainly to younger migrants and that has some balancing impact. The main focus of the session was on pensions. The Hutton Report shows clearly that the cost of public pensions will fall from 2% of GDP to 1.8% in 2030 and 1.4% in 2060 as a consequence of the 2007/8 reforms. In addition, other recent changes to schemes will reduce costs even more including: increased member contributions; switching from RPI to CPI will save at least 15%; and a later retirement age. As a consequence employer contributions in the Scottish LGPS are already reducing since the 2008 changes. But cost is only one aspect of the issue. One in four workers in UK earning less than £300pw have no pension provision. At a time of wage restraint and rising costs these numbers are likely to rise as more workers opt out of good schemes just to put food on the table now. Auto enrolment will at best make a marginal difference as the amounts put in are inadequate for a decent retirement income. This will be compounded by later retirement ages as many Scottish workers calculate that they are unlikely to live long enough to collect their pension. The committee also asked about pension investment. The Scottish LGPS has assets of over £20bn and we believe this could be used more effectively to support the Scottish economy. There are challenges in doing this, but improve governance arrangements could assist this process. This will be a high priority for the trade unions in the coming scheme review. An ageing population is going to be a challenge for Scotland in the coming years but we should remember the positives. Good quality pension schemes for everyone are essential and affordable. Today is Human Rights Day. This is an opportunity to celebrate human rights, highlight a specific issue, and argue for the full enjoyment of all human rights by everyone everywhere. This year, the spotlight is on the rights of all people to make their voices heard in public life and be included in political decision-making. These human rights — the rights to freedom of opinion and expression, to peaceful assembly and association, and to take part in government (articles 19, 20 and 21 of the Universal Declaration of Human Rights) underpin democracy across the world. Not just voting in elections but the right to protest. The Arab spring and the occupy movement are just two recent examples. The Scottish Human Rights Commission is using the day to promote Scotland’s National Action Plan for Human Rights. This is a first in the UK and will set out how to “fill the gaps” as well as build upon good practice in human rights protection in Scotland with public bodies, civil society and others already getting involved in discussing what it would contain. Attacks on the European Court of Justice in decisions such a prisoner voting. These attacks fail to understand that the ECHR is now integrated into our system of justice. Not forgetting the irony of attacks on judges from those who preach the rule of law to others. Judges overturning the decisions of elected representatives. Most democratic states recognise that there have to be underpinning rights that protect people against arbitrary law making. Those advocating a Bill of Rights should also recognise that in jurisdictions that adopt this model, judges tend to be much more interventionist and powerful. That we risk only giving legal rights to the 'worthy citizen' as against the principle of equal treatment. Deportation and immigration cases illustrate this point well. I covered some of these issues at this time last year when Shami Chakribarti visited Scotland. She felt that Scots take a more positive view of human rights than the rest of the UK. I suspect this is based more on the absence of a ranting tabloid press than any greater understanding. However, I do believe that we can win the argument that Scots are human beings before we are citizens. I was speaking at the Institute of Rating, Revenues and Valuation conference in Crieff yesterday. These are the professionals who are having to grapple with the consequences of the Welfare Reform Bill and I was talking about the staffing implications. There are many challenges facing local government staff in this area of work, but the largest is implementing Universal Credit. This brings together seven different benefits with the aim of simplifying the system. Sadly, the government does not appear to understand that just sticking things together does not automatically simplify them. As they are already discovering, the complexity of the computer system alone is daunting, with out of work and in-work benefits being administered for millions of claimants. • the overwhelming number of claimants don't have a computer. Even with limited library access most don't know how to use one. Not to mention poor connectivity in many parts of Scotland. • The government is always going on about choice. But Dumfries & Galloway Council surveyed their 'customers' and only 2% wanted online access. •Many claimants don’t have transactional bank accounts. •Weekly payments will now be paid monthly in arrears. There will be huge issues managing family finances for the first few weeks. The impact is not just on Housing Benefit staff who face an uncertain future. The Council Tax is being devolved and cut at the same time. Hard pressed Scottish Government and council budgets have plugged the gap for the first year, but that will become increasingly difficult in the years ahead. The social fund is to be be administered locally at a time when other welfare benefits are being cut and a single fraud investigation service created. Add to this the local economic impact estimated at some £2.5bn in Scotland alone. This will impact on local businesses and councils who will have to provide even more services. Not to mention the voluntary advice agencies like CAB. There are huge consequences for housing staff in councils and housing associations. Housing associations will receive £33.5m less per year with serious consequences for housing investment, already at crisis levels. For claimants the uprating shift from RPI to CPI means £50.3m less from this alone. The inevitable result will be a massive increase in arrears and bad debt. If will also impact on the Scottish Government's homeless target with CoSLA estimating an additional 3000 homeless presentations in Scotland. The Scottish Federation of Housing Associations (SFHA) summed this up well in their evidence to the Scottish Parliament's Welfare Reform Committee, "we are seriously concerned about the impact that the introduction of Universal Credit will have upon the way that tenant households manage their finances and live their lives, as well as the serious business and financial challenges it will present to landlords". As usual it will be council staff who will have to pick up the pieces. What is needed is local delivery retaining the face to face contact that is so important to these claimants. Right first time should be the approach, not leaving claimants to manage their way through the complexities of on-line systems or remote call centre operations. Amid the failure report that was the Chancellor's 'autumn' statement there was what appears to be some good news in the form of £330m of Barnett consequentials for Scotland. Sadly, this is not quite as it seems. To start with Scottish capital budgets have been slashed by 35% in the current spending round so at best this is simply returning a small amount of the planned cuts. If this was additional capital funding it would be welcome, but it isn't. It's being funded by cutting departmental revenue budgets (Scotland is a department in UK terms) by 1% next year and then by 2% the year after. This means we get a one off boost at the expense of a recurring revenue cut. It is at least arguable that at this stage of the economic cycle what we need is revenue not capital spending. Capital spending has significant leakages from Scotland. The contracts may go to firms outside Scotland and even staffed by workers who are brought up here. Materials are purchased outwith Scotland, like Chinese steel for the Forth Bridge, leaking more of the spend. Even the tax revenue is not guaranteed given tax avoidance schemes in the construction industry. In contrast, revenue spending on public services is much more likely to be spent in the local economy and drive the demand deficit that is the major economic problem we face. The Chancellor has added to this problem with his additional cuts to welfare provision. That leads to how the 'extra' cash should be spent. I would argue that because of the revenue cut, shovel ready projects may be the wrong spending decision. The cash should be spent on projects that deliver preventative spending, thereby reducing demand on the revenue budgets that now face a further cut. As always with this Chancellor good news comes at a price. But it also comes with a headache for the Scottish Government. In yesterday’s Scotland on Sunday I have been described as, “officially Scotland’s leftiest Englishman”. I must have missed this awards ceremony although I have no difficulty with the accolade, even if it is probably undeserved. Firstly, I presume the award is limited to the mainstream left, as I can already hear the growling from the far left fringe for whom I am a mere bourgeois revisionist. Secondly, I was born in England (Liverpool actually) and have no problem in being classified as English – although the Watsons on my Dad’s Scottish side would not be so relaxed! Thirdly, I can think of a number of comrades who would also be justified contenders for this award - Richard Leonard, Dave Moxham, John Foster and others immediately spring to mind. The semi-serious point in the piece is the suggestion that I have become a supporter of Devo-Plus. Wishful thinking here I’m afraid. I certainly did give a favourable review to Murdo Fraser’s piece in the Scotsman, and as I have blogged at Red Paper, the last two papers from Devo-Plus have been a useful contribution to the debate. I do think Devo-Plus have done some useful work on the mechanisms of extended devolution, but less so on the purpose. However, that is some distance from endorsing Devo-Plus and certainly their backers Reform Scotland. My critical posts on their reports prove that. Another Scotsman piece by Eddie Barnes more accurately reflects where I, and most, but not all of trade union movement in Scotland, currently are in the constitutional debate. Perhaps more interesting than my views are the differences between English and Scottish political opinion. John Curtice and Rachel Ormston published a paper on this for ScotCen a year ago based on Scottish and British Social Attitudes surveys. They argue that people in Scotland are only a little more concerned than people in England about issues like income inequality. While I accept the differences may not be as wide as common myth would have it, the differences are significant. For example 43% of people in Scotland think the government should redistribute income, compared to 34% in England. More recent data, after the tax dodging scandals, would suggest that opinion is shifting leftwards on this point across the UK. This statistic and others in my view show significant differences. We can also look at actual voting patterns and the sort of issues people living Scotland highlight during elections. The English are Scotland’s largest minority group and I have heard it suggested that this might explain the coming together of attitudes. The numbers have grown steadily to over 400,000 since the 1950’s, although we should remember that almost twice as many Scots have gone in the other direction. This was looked at by Murray Watson (no relative) in his book ‘Being English in Scotland’. He concluded that the English tend to adopt the more progressive social attitudes of their adopted country. Difficult for me to judge as I was a lefty Englishman before I came to Scotland 22 years ago. Maybe it’s in the genes! Today I was at the formal launch in Glasgow of “For a Fairer Scotland” – a document which outlines UNISON Scotland's priorities in the debate on the constitution. We drafted this paper following a series of meetings with UNISON members. This is not a Think Tank paper drafted in a meeting room, it reflects the concerns of our 160,000 members who deliver public services across Scotland. So we are not interested in an argument about national identity. It’s not where the power lies, but in whose interest that power is exercised that really matters. What we are looking for is a willingness to tackle inequalities, poor health and deprivation. Unless it is explained how this is to be achieved, arguments for or against constitutional change mean very little. Alongside this paper we have framed questions that members will be encouraged to put to all those campaigning around the referendum in the coming months. These focus on public services, rights at work, equality, jobs and the economy. The latest twist in the 'Polishambles' that is the new centralised police force was played out at the Justice Committee this week. Chief Constable Stephen House said he is "struggling" with Vic Emery, the chairman of the Scottish Police Authority (SPA), over who should have day-to-day control over human resources and finance. Steve House believes they should be under his supervision while Vic Emery believes they should remain closer to the SPA structure. Steve House told the Justice Committee about "grey areas" in governance and ambiguities in the Police And Fire Reform Act, including "a gobsmacking major problem" where the Act does not appear to give him control over police support staff. The two men said they have taken their own legal advice to discern what their roles and responsibilities would be. I watched this 'Polishambles' with a wry smile. My Mum always told me that it isn't polite to say, "I told you so", but there are occasions when I can't resist and this is one of them. With any legislation UNISON is involved in I usually start with an issues schedule. This lists all the possible difficulties that we will need to raise with officials, ministers and MSPs. Right at the top of my schedule with this Bill was the respective roles of the SPA and Chief Constable and who would be the employer of Police Staffs. It was plainly obvious that the structure was going to create difficulties and the position of Police Staffs in particular was unclear at best. Contrary to Vic Emery's insulting assertion about Police Staff just being 'staff'' until he hands them over, they have a clear statutory definition in s26 of the Act. They also transfer to the new organisation with their existing status. What isn't in dispute is that they are employed by the SPA (s26(2)(a)). The confusion arises because the same section of the Act also gives the Chief Constable the power to make appointments, and more importantly, s17(3) gives him the power to direct Police Staff. There are others, but you get the idea. If ever there was a recipe for confusion and mixed accountability this it is. The real structural problem goes wider than the status of Police Staff. Creating the SPA and the PSS was always going to cause problems. What the Scottish Government should have done is to create a unitary organisation that the Chief Constable reported to. Other governance arrangements could be put in place for forensic services to create the perceived need for separation. A national joint board would also save £millions in VAT, as we also pointed out. It is a well understood structure with roles and responsibilities clearly defined. Of course it would also mean slightly less opportunity for political direction from the Cabinet Secretary! Having botched the legislation the Scottish Government needs to resolve the mess they created. While we have had our our differences with Steve House over his views on civilianisation, it simply isn't credible to ask him to run the service when key functions are directed elsewhere. The wider lesson for government is that it is better to listen more carefully to the views of those who understand the services they are reorganising. 'I told you so' may give a certain level of satisfaction, but I would rather we didn't get into this 'Polishambles' in the first place. Kenny MacAskill, the Cabinet Secretary for Justice, has decided to open up the question of local government reorganisation when speaking at a policing conference last week. He said the move was “inevitable” following the merger of eight regional police forces and fire brigades into single national bodies. Translated, this appears to mean that while there will not be a formal reorganisation, structural change can happen by stealth. In a previous blog I have highlighted the growing tendency towards centralisation. Police, fire, care integration, better regulation and ring fenced funding are just a few examples. The Convention of Scottish Local Authorities (Cosla) warned that structural reform was a “costly diversion” from providing better services. Willie Rennie, Scottish Liberal Democrat leader, said: "Fiddling with boundaries doesn't address the major challenges of climate change, demographic changes and big pockets of poverty. The SNP need to rule out mergers and centralisation and focus on the major challenges that Scotland faces." As the Christie Commission and many others have pointed out Scotland is the least democratic country in Europe with the largest population per lowest tier of local government. Similar countries have far more councils including Norway (430), Finland (336) and Denmark (98). The Jimmy Reid Foundation report – The Silent Crisis: Failure and Revival in Local Democracy in Scotland – examines the impact this disparity has had on Scottish democracy and on voting turnout. The Liberal Democrat’s Home and Community Rule Commission also covers these issues and like others they are suggesting a smaller tier of councils built around real communities. A less well known Christie Commission proposal was consideration of single purpose councils, something the islands have been looking at seriously. Whatever your view of local government structures there is an urgent need to stand up for local democracy. Further centralisation should be resisted. UNISON Scotland is planning to open up this debate early next year with a consultation paper and a detailed study of the options. We will be encouraging the defence of strong local government before it is too late. The UK Government has introduced new immigration rules with effect from 9 July 2012. These changes will affect non-European Economic Area (non-EEA) nationals applying to enter or remain in the UK under the family migration route. It means that people earning less than £18,600 are unable to get visas for partners from non-EU countries. British citizens who previously would have been granted a spousal visa are forced to choose between ending their relationship, splitting up their family or attempting to live abroad. In addition, from October 2013, all applicants for settlement have to pass the Life in the UK Test and present an English language speaking and listening qualification. This is particularly challenging for very elderly relatives. Scottish examples of this have included a hospital consultant who is leaving the NHS to work abroad, in order to care for his mother. The Independent newspaper gives other examples. Don Flynn, director of the Migrants' Rights Network said: "Being able to start a family in your own country should not be subject to the amount of money somebody earns. These measures create a two-tier system: those who are rich enough to live with whom they choose and those deemed to be too poor to live with somebody from abroad." Scottish Labour MP Ann McKechin has been campaigning on this issue at Westminster and has been collecting a range of Scottish case studies. We have also had a couple of requests for advice from UNISON members who are concerned that they will be impacted by these new rules. These examples show how the rules are not only unfair on the individuals concerned, but also impact on our public services in ways that may not have been intended. For example, NHS Lothian this week quoted immigration rules as one of the causes of paediatric doctor shortages that may result in ward closures. It is a common misconception that immigration rules only apply to foreigners. But these rules affect British citizens and often leave them in an impossible position. There have already been legal challenges and we can expect more. The government should have an urgent rethink. A report published today by the Accounts Commission and Her Majesty’s Inspectorate of Constabulary for Scotland (HMICS) highlights the appalling waste of resources inherent in a process that takes police officers off the streets to backfill police civilian staff at a greater cost. As we have warned many times, Best Value is being sacrificed to a cosmetic political target. Well I was wrong in one respect. It only took HMICS and Audit Scotland a few months to point this out! And of course we know that if the Scottish Government continues to direct the new Scottish Police Authority on police numbers, it will continue. What is also new in this report is the focus on police overtime to cover police staff posts. I have seen a report in one police area that states the costs of backfilling police officers into custody centres has already exceeded £250,000. This report confirms not only that police officers are backfilling police staff jobs at greater cost, but expensive police overtime is increasing to plug the gaps. 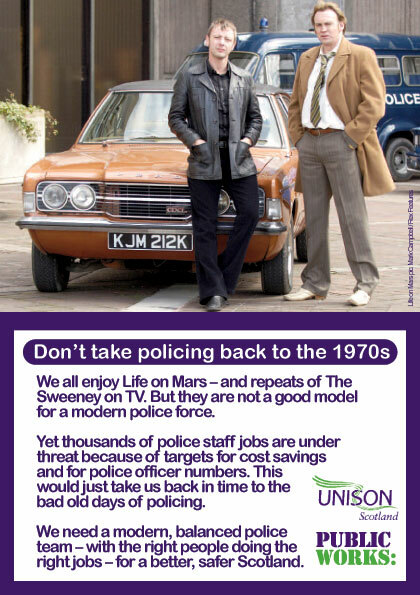 It also supports UNISON's call for strategic workforce planning to avoid this appalling waste of scarce resources. The SPA and Chief Constable must be allowed to apply the statutory duty of Best Value without political interference. "The main objective of the Bill is to increase the number of workers in Scotland who are paid the Living Wage. This consultation seeks views on two approaches which could be pursued independently, in their own right, or together as a package, namely delivering the Living Wage through the public sector procurement processes, and/or by promoting the Living Wage so as to encourage employers, in all sectors, into paying their lowest paid workers the Living Wage." I have previously dealt with the procurement aspects of the living wage. In my view this should be incorporated into the forthcoming Procurement Bill. The only blockage is the ill advised letter from Alex Neil MSP to the EU Commission. It is possible to get around this by legislating on different grounds as we have explained in our response to the Scottish Government consultation. The second part of John Park's Bill is equally important and has perhaps received less attention. "The general duty on Scottish Ministers to promote the Living Wage will be essential in providing the momentum needed to increase the number of people being paid the Living Wage." This involves a strategic plan and reporting to Parliament following consultation with appropriate interests. This would not only put a political focus on the Scottish Living Wage, but it would also ensure it was consider by officials when drawing up other plans and proposals. A key element of this is the creation of a Living Wage Unit. They would not only promote the issue internally would would be an important source of advice externally. For example, procurement is a complex area and public bodies need guidance and support in drawing up contracts. In addition the London experience shows that the benefits to the private sector can be promoted through a unit that can demonstrate a strong business case for the Scottish Living Wage. The best way to do this is probably to create a stand alone Commission reporting to Parliament together with some resource within the appropriate government department. That provides the necessary independence while ensuring that government gets the support it needs to ensure they actually deliver on the ministerial duty. UNISON Scotland strongly supports this member's Bill and hopes it can attract cross party support. There has been good progress with the Scottish Living Wage in the public sector, much more than elsewhere in the UK. The next stage is to spread the social and economic benefits to the private and voluntary sectors. That is the main purpose of this excellent Bill. IPPR have published a booklet, 'The relational state: How recognising the importance of human relationships could revolutionise the role of the state.' The aim of this collection of essays is to examine the concept of the 'relational state', claiming that this is a new perspective on the role of public services. The starting point for these ideas is dissatisfaction with the 'New Public Management' (NPM) model that dominated New Labour thinking, driven by targets and markets. "A ‘targets and terror’ approach can be effective in addressing terrible performance, but it is poorly suited to supporting excellence, because it hampers flexible responses to local demand and constrains innovation and creativity. Command and control techniques have also led to the growth of expansive monitoring, inspection and auditing processes, which are a drain on time and money." This approach was far less prevalent in Scotland, but elements of it have crept into management thinking. In this booklet some authors argue that the edges need to be smoothed off NPM and its core methods redirected towards different, more relational, goals. Others mount the case for more fundamental change, affecting both the aims and practices of public services and the state. However, there is a consensus on the need for human relationships to be given greater priority as a goal of policy and in the design and operation of public services, which challenges a strict adherence to egalitarian goals and state-led agency above all others. The relational state inevitably puts a focus on localism and the booklet does not duck the tension between equality and localism. On the one hand, devolving power and responsibility to local authorities, service providers, frontline professionals or citizen-users is seen as necessary to create the conditions for relational activity. On the other hand, this rubs up against the countervailing instinct to seek to advance more equal outcomes or opportunities of various kinds. Greater scope for variation and contingency opens up the risk of ‘postcode lotteries’ and a ‘race to the bottom’. I suspect the answer is that they want both, but not for every service. In some services there is a strong case for co-production, in others it is simply an issue of service delivery. Relational practice is also already present in some services. While I found much to disagree with in this booklet, it is a useful contribution to the debate around public service reform in Scotland. Parts also chime with UNISON Scotland’s approach to reform based on building services from the bottom up. As the authors admit, this book marks the beginning of a debate, not the end. Back in Parliament today to brief MSPs ahead of tomorrow's debate on the Freedom of Information Bill. Openness and transparency in public life is the hallmark of a democratic society and Scotland has been slipping behind in FoI best practice for some years. Our key concern is to get the scope of FoI extended to all those organisations that deliver public services. The growth of arms length organisations from councils, private and voluntary sector contractors means that there are two tier standards for the public right to know. If your service comes from a public sector provider you have the right to information. If the very same service comes from a private or voluntary sector provider, you don't. That cannot be right and needs to be changed. I illustrated our case with our extensive FoI work on PPP/PFI. After a long battle we got much of the documentation, but not all. For example, Scottish Water and the government say key documents can't be found. However, I doubt if the contractors for the problematic sewage plants have lost their copy. This matters because as a result of our research we discovered that the taxpayer spent £2.1bn more on PFI schemes than they would have done if these projects had used conventional finance. And it's not just an historical issue. The Scottish Government has a current £2.5bn PPP/PFI programme. Credit to Carole Ewart and the Scottish Freedom of Information Campaign for all their work on this issue. There is cross party support on this issue and Willie Rennie MSP chaired today's event. We don't always agree with the Lib Dem's these days, but they have a consistently positive record on FoI. I do hope that the new minister, Nicola Sturgeon MSP, takes a fresh look at the government's position on this issue. They claim to support some extension to the scope of FoI, but have done nothing about it. We have had three different consultations in recent years. Now, I am not surprisingly a big fan of consultation, but we are all consulted out on this issue. Now is the time for action. "Calls on the Parliament to urge the Scottish Government to review the considerable research into the thinking that underpins the approach to managing the contribution from staff that has been undertaken over the past decades and compare this with the assumptions that underpins existing management practice; and subsequently to use the findings to ensure that it harnesses the talent of its staff." A recognition that the driving force for progress will not come from central direction but from innovative people at the work face. There is a very good booklet explaining this approach at the Unreasonable Learners website. This approach very much ties in with UNISON's view that public service reform should be built from the bottom up, rather than by management consultants centralising services with their Blue Peter, "here is one I prepared earlier" method. I illustrated the point with an example of a local authority that had centralised housing benefits. The staff involved in the enquiry point told me that they used to be able to deal with 80% of queries first time. Now they deal with about 20% and the rest are sent to a call centre. The staff in the call centre spend most of their time dealing with what John Seddon (systems thinking) calls, 'failure demand'. Examples like this led to the Christie Commission recommendations. As most public services are delivered by people there needs to be a much greater recognition of workforce issues in government plans. Most current reforms give the impression that workforce issues are a last minute add on - not central to the reform. Workforce reform appears to be rooted in 'heroic leadership' models that are simply not suited for the enabling approaches needed to break public services out of their different silos. In my experience many public and private sector leaders talk a good game on systems thinking, but don't really get it in practice. I also argued that we need a workforce framework across our public services that underpins reform. An approach that enables public service staff to design, with service users, innovative new ways of delivering services. It was agreed that the group brought together by the Petitions Committee this morning would attempt to produce a paper on how this different approach could be promoted. Developing a different management culture in Scottish public services. A big task, but we have to change direction quickly if we are going to deliver meaningful reform. I was in London today at the UNISON bargaining seminar. I have valued the TUC economist Richard Exell's posts on the Touchstone blog, so I was keen to hear his presentation. With his trademark graphs he showed that we are in the slowest recovery from recession for 125 years, yes that's the 1880's! This is because household spending is still depressed, trade is negative and investment is low. No surprises there, but I hadn't realised that household spending started to decline well before the crash, in 2005. The causes are clearly linked to negative wage growth. In Richard's view we may not get back to 2009 levels until 2021. So this longest recovery from recession is set to run and run. While there has been an increase in employment, most of this is part-time work and self-employment. Hardly the best time to be starting a business and he pointed to the many workers who have invested their redundancy payments, only to lose it all. A more relevant statistic is the ratio of unemployed people to job vacancies. This shot up from just over 2-1 to nearly 6-1in 2008 and has remained stubbornly at that level ever since. Not much joy in the city forecasts either. Modest growth at best, unemployment remaining at current levels and borrowing levels broadly unchanged. Even the IMF forecasts have been downgraded. His conclusion was that the second dip may be ending, but stagnation lies ahead. This is due to real wages remaining depressed. With government policy rooted in public service cuts and wage freezes, there is little cause for optimism. Today is the start of Living Wage Week. This opportunity to promote the Scottish Living Wage got off to a good start with the announcement that the current rate of £7.20 per hour is to rise to £7.45. The Scottish Living Wage campaign supported by UNISON Scotland has a number of events planned for this week. There has been good political support as well with Ed Miliband's speech today. This follows yesterday's Observer piece by Dave Prentis and David Miliband. We also have an excellent Fair Wage campaign by the Scottish Youth Parliament. The Institute of Fiscal studies has calculated sub-living wage employers cost the taxpayer £6bn a year in in-work benefits alone. The indirect cost on poverty is around £25bn a year. In contrast the cost to employers is minimal at around 1% of wage bill. Even in the retail sector it is only 5%. As a recent study of the London Living Wage shows, even that can be recouped through decreased turnover and better productivity. I don't often, if ever, quote Boris Johnson positively but he say, “I believe that paying decent wages reduces staff turnover and produces a more motivated and productive workforce”. Use the Procurement Reform Bill to amend the Public Contracts (Scotland) Regulations 2006 to require that the living wage is a part of any contracting authorities bid for a public sector contract. Seek to influence the European Commission to remove any perceived barriers in EU Directives that prevent the inclusion of the living wage in procurement. Establish a Living Wage Unit to advise on, promote and oversee the living wage in the public sector and in procurement. In partnership with stakeholders, develop and produce a Code of Practice on promoting the living wage in procurement. Scottish Labour MSP, John Park is also consulting on his private members bill that seeks to achieve the above objectives. Government’s at UK and Scottish levels also need to recognise the broader economic case for an increase in real wages. The shift in incomes from workers to the very rich is a key cause of the longest and deepest recession in a generation. Low paid staff spend more of their income locally. While we have made good progress in achieving the Scottish Living Wage in the public sector, nearly one in four Scots are still earning below that level. So more action is needed to extend the considerable benefits across Scotland. Today, I submitted UNISON Scotland's response to the Scottish Government's consultation on the proposed Procurement Reform Bill. Procurement is not the most exciting issue I have to deal with, but it is one of the most important. We should view it as an opportunity to ensure that annual procurement spending of nearly £11 billion in Scotland is used to deliver important social, economic and environmental benefits, including improved protections for workers. The consultation proposals are, to put it generously, very modest. 'Business friendly' appears to be the theme with the wider benefits marginalised. So today we have focussed on just one of our more radical proposals. Scotland should ban companies involved in tax dodging from public contracts. It is entirely wrong that companies seeking to avoid paying their fair share of tax should be awarded public contracts. We think this is an important opportunity to do what some European cities such as Helsinki and Paris are already doing, in acting against companies using tax havens. Our message to the Scottish Government is that they should adopt a tax justice approach, finding ways, with appropriate legal advice, to bar companies involved in tax dodging from being eligible to bid. As SNP and Labour MP's at Westminster have supported this approach, we are hoping for something of a cross party consensus on this issue. Recently public outrage has focused on big-name companies like Google, Amazon and Starbucks paying miniscule amounts of tax. But it is much more widespread as the Tax Justice Network has highlighted and I have covered in past blog posts. Richard Murphy is the UK's leading expert on these issues and he welcomed our initiative on his blog today. Many companies investing in PPP/PFI projects are registered in tax havens and as the Scottish Government has the biggest PPP/PFI programme in Europe, this sort of measure could help change tax dodging companies approach to paying tax. So let's send a very clear message - if you want contracts funded by the taxpayer, you have to pay tax like the rest of us. My work over the past two days has been focused on pensions, following the second reading of the UK Public Service Pension Bill on Monday 29 October 2012. UNISON has a range of concerns over this Bill, although my efforts have been concentrated on the specifically Scottish aspects as they impact on the Local Government Pension Scheme (LGPS) in Scotland. And to correct some mischievous briefings, we did not ask MPs to vote against the Bill. Our concerns can and should be addressed at the Committee Stage. Primary pension legislation is a reserved issue mainly covered by the UK Superannuation Act 1972. This is largely enabling legislation that allows the Scottish Parliament to design schemes by regulation that meets Scottish requirements. In practice the NHS scheme closely follows England because changes to the scheme require Treasury approval. No such approval is required for the Scottish LGPS because it is funded in Scotland and that remains unchanged in this Bill. However, the Bill prescribes key elements of all schemes and that will apply to the Scottish LGPS for the first time. All of these matters are currently decided in Scotland and therefore significantly undermine the current and future Scottish LGPS agreement. If the Bill goes through unchanged the Scottish Parliament will be required to bring the LGPS into line with agreements reached in England on key issues. These may not reflect Scottish circumstances and constitute an unwarranted interference by the Treasury in Scottish provisions. UNISON has taken legal advice that this legislation requires the approval of the Scottish Parliament through a Legislative Consent Motion (Sewell convention). Surprisingly, the Scottish Government has not taken action on this issue to defend the prerogative of the Scottish Parliament. Officials have advised ministers that Sewell motion is not required. However, thanks to a question tabled by Cathy Jamieson MP, the Treasury has now confirmed that a Sewell motion is required. We suspect that this is only on fairly narrow grounds, but it opens the door for Scottish Ministers to demand that the Bill is amended to retain the current powers of the Scottish Parliament on this issue. While this is undoubtedly a power grab by the Treasury, we do not accept that Scottish Ministers are powerless to act. The big boy did it and we ran away - wont wash here. I was speaking at the Holyrood conference on shared services in Edinburgh today. Sir John Arbuthnott gave an overview of progress in the Clyde Valley initiative. A number of sensible collaborative projects have made reasonable progress. The problem is that the big ticket item was support services, despite Sir John's advice that this should not be the focus. He rightly said that back office services are very important and there are not massive savings to be had. The presentation from Glasgow focused on the need to take cost out of the back office to protect frontline services. It was unclear how much of this was real savings rather than simply cost displacement. Lots of impressive looking activity statistics, but how much of that is dealing with failure demand? I was less than impressed with the idea that the recipe for success was to, "stick with it through thick and thin". Sounds like let's ignore the evidence when it doesn't fit with our preconceptions. The speaker from the English LGA demonstrated the wide range of shared working models. The claimed savings figures looked pretty unimpressive and probably pretty dodgy as well. A later speaker highlighted the NAO report on Whitehall shared services that came in well over budget and delivered a reduced level of service. There were some interesting case study presentations from the Scottish Government, NHS Scotland, Fire and Rescue and Stirling Council. There was some honesty about the difficulties in delivering shared working and what had actually been achieved so far. The NHS speaker emphasised that working in partnership with the trade unions was vital, arguing that they add value to the process. All speakers agreed that shared services was only one tool and not appropriate for all. My presentation sought to turn the focus from top down solutions to a view of service delivery from the frontline perspective. While UNISON is not opposed to collaborative working, we are against large scale back office factories driven by the 'here is one I prepared earlier' consultants. International and UK evidence shows that this approach rarely delivers the promised savings or quality of service. I gave a number of examples of how claimed savings are often simply cost displacement from central services to operational departments. I backed this up with a UNISON Scotland survey produced for the APSE 'The Front Line Starts Here' booklet. This shows how operational staff now spend hours each week undertaking administrative tasks. Richard Kerley made similar points about what works and what doesn't, based on a wide range of studies in the UK. Like me, a qualified supporter of the system thinking approach. In summary, one of the benefits of Scotland's collaborative public service model is that shared working should be easier to achieve. However, that is not the same as centralised shared services. We should design service delivery from the user up – not with consultants from the top down. Mental health issues are getting a lot of attention in this morning’s media, rare for a subject that is often taboo. • Almost exactly a quarter (25%) have worked in the last month when really too ill. Around 60% worked when ill in the last year. • More than a quarter (27%) did so because concerned that manager would take action against them. Most of the rest for the altruistic reasons such as letting colleagues or service users down. • Nearly a half (47%) say the sickness policy at work encourages people to work when they really shouldn't. One in seven (14%) say the policy at their workplace is "unfair". A quarter (26%) say it is badly implemented by management. • 60% say there is a stress policy in place but it is not effective - a further 28% say there is no stress policy at all. Last Friday, at UNISON Scotland’s safety conference, we heard from the mental health charity SAMH about mental health at work. They highlighted that three in every ten employees will have a mental health problem in any year, making mental health the dominant health problem among people of working age. The business case for tackling this is overwhelming with output losses of over £2bn last year or £950 per employee. The solutions include recognition, prevention, early identification of emerging problems, awareness training, access to professional health and effective rehabilitation. So let’s welcome this new political focus on mental health and recognise that effective action in the workplace is long overdue. I am at Stirling University today, speaking at our annual health and safety conference. Part of health and safety at work week. I am launching the UNISON Scotland annual survey of violent incidents reported to public service employers in Scotland. There were 34,739 staff reported incidents last year. This compares to 20,000 incidents when the first survey was undertaken in 2006. There has been a big increase in incidents in local government by 2257 to 14274. While there has been a marked improvement in reporting that may explain some of the increase, there are also 7,000 fewer staff working for councils. It is noticeable that the biggest increase in violent incidents is happening in those council services that are facing the brunt of spending cuts. Staff are stretched too thinly, dealing with service users facing cuts in the services they rely on. This is a toxic cocktail that is putting hard pressed workers at greater risk of violent assault. The NHS shows a further decrease in incidents by 967 to 10,974. However, the two largest health boards (Glasgow and Lothian) were unable to produce figures this year, so these figures have to be treated with caution. While we are pleased that many employers are improving their systems, others have obviously got some way to go. If they can’t produce decent statistics they cannot be tackling the problem. Convictions under the Emergency Workers Act have increased by 44 to 324. Due to the limited scope of the Act few violent incidents result in criminal action. Efforts to address this were blocked by the Scottish Government when they opposed Hugh Henry MSP’s, Protection of Worker’s Bill. These figures demonstrate an appalling level of violent incidents faced by staff who are simply doing their job. Employers must redouble their efforts to protect workers and the Scottish Government must play their role by strengthening the criminal law. Scotland is rightly proud of it's ground breaking climate change legislation. In 2009 the largest civil society coalition Scotland has ever seen, campaigned successfully for legally binding targets to reduce Scotland’s climate change emissions. UNISON Scotland was pleased to be part of that coalition. However, as is often the case in politics, there is a but as this video shows. The most recent emissions data for Scotland showed that not only had the targets for emissions reductions for that year been missed, but that greenhouse gas emissions in Scotland had actually increased by 2%. This is despite the recession that would have a downward impact on the numbers, even without government action. The Scottish Government’s action plans to meet the climate change targets have fallen short and there is a real contradiction with plans to boost oil output and other spending that will increase carbon emissions. Tom Ballantine's piece in the Scotsman explains this in more detail. We all accept that this isn't easy. UNISON focused on two areas where we warned the planned actions would not match the rhetoric. As we predicted the public duty guidance has turned out to be a toothless document, gathering dust on shelves. Heroic leadership models simply don't work. Climate change action needs to be built up from the bottom and the plans failed to recognise the key role of workers in driving effective action. And that leads to our second point. Most emissions come from workplaces, therefore any strategy that ignores that fact is bound to fail. Green workplace initiatives have worked well when they have been run, demonstrating worker support for tacking serious action. But they have simply not been encouraged or supported at the level required. If you cant get to today's parliamentary lobby organised by SCCS, write to your MSP, tweet or take some other action to help show that people across Scotland still care about climate change. I was in Parliament today giving evidence to the Justice Committee on the police reform budget. My written evidence tells the sorry story of the half baked business case that wasn't even completed before Parliament passed the Police and Fire Reform Bill. Then the shambles over VAT liability, when Treasury officials had told the Government that if you organise police and fire this way, the Scottish taxpayer will pay the VAT. This results in a major savings target that would be challenging enough. However, the Scottish Government has an arbitrary target to maintain police officer numbers at 17,234, therefore the cuts are concentrated on police staffs. Up to 3000 posts are likely to go with the gaps being filled by police officers. A recent survey indicates that up to 2000 police officers will be taken off operational duties, at least in part, to backfill the posts. So much for the promised 1000 extra police officers “on the streets”. The latest ACPOS cuts proposals give us some indication of the numbers of posts and these are set out in some detail in my evidence. Some of these cuts (HR, finance and corporate services) are aimed at economies of scale created by one centralised police force. However, past experience of such savings is that they are rarely achieved and certainly not without passing the workload onto operational staff. The vast majority of these job cuts can only be achieved by substituting police officers for the roles currently undertaken by police staffs. These include custody staff, front office, traffic wardens, licensing staff, clerical support, intelligence gathering, control room and forensic staff. This is already happening with police officers being drafted in, typically at twice the salary, to undertake these duties. At today's evidence session there was at least a greater recognition that backfilling is wrong. Although some senior officers are still turning a blind eye to what is happening on the ground. I would challenge any politician to just walk around any police headquarters and see how many police officers are there, not on the streets. A week does not go by without a member telling us of even more officers taken off operational roles to undertake police staff jobs. Taking trained operational police officers off the streets to perform administrative or specialist tasks – at greater cost, is economic madness. It is also contrary to the Best Value provisions in the Act. This will return the police service in Scotland to almost the 1980‟s, with inefficient and outdated police practice. The Sweeney may be back on our cinema screens, but it isn't a model for a modern police force. The sensible way forward should be to let the Scottish Police Authority and the Chief Constable decide the correct balance of police officers and police staff using Best Value principles. They should not be subject to a political direction that effectively restricts cuts to police staffs. Tomorrow I’ll be joining thousands of people marching through Glasgow for the STUC demo. I am particularly pleased to be marching from George Square, the traditional point of protest in Glasgow. Credit to Glasgow councillors for recognising that George Square is the people's place, not simply to be fenced off for commercial interests. I am not marching because I think the ConDem coalition will suddenly realise the error of their ways and reverse the austerity economics that is throttling the Scottish economy. I do believe that a large turnout tomorrow will show the government the extent of the opposition to their plans and give hope to those who are suffering the consequences of cuts to their services and jobs. I also believe that marching is an important act of solidarity. It brings together the many people who campaign against the cuts in their own small way, in their own communities, acting as a reminder that they are part of a much bigger movement. This march is for them. It is only one form of protest, but I do not accept the view that it has been eclipsed by other methods. It shows the millions who can't be there that there are many others who believe that there is a better way. That there is an alternative to mass unemployment and poverty wages - particularly for another lost generation of young people. While I will be marching in Glasgow, the primary target for our protest will be the UK government because they are the driver of austerity economics. Even if the Scottish Government has made some poor choices over local government, police staff, colleges and others, they are only juggling the consequences. I write this in Perth at the SNP conference. Almost every speaker, in almost every speech, tells us that the solution to austerity economics is independence. A Tory free Scotland if we just shake off the shackles of the Union. Sadly, what is usually missing, is any credible explanation of how that is going to happen. They will need to do much more if they are to convince us to vote 'yes' in the referendum. They may be helped if Labour fails to develop a vision of greater devolution and social justice, independent of the equally dire Better Together campaign. And on the issue of solidarity, I will be marching for the same reasons as comrades in Belfast and London. Poverty with a kilt on is still poverty. I am not uncritical of Ed Miliband on several issues, but he has not taken the New Labour view that an opposition leader attending demos is making a tactical error. He understands that a Labour leader also has to demonstrate solidarity. So that’s why I will be marching tomorrow. In solidarity with others who are suffering the consequences of austerity, and those who campaign against the ConDem government. It may not change anything directly, but it’s important, if nothing else for morale. Those marching alongside me may have a different vision of the future, but most of them will certainly be better than austerity. This is European Local Democracy Week. Every year between 15 and 21 October, the ELDW brings together local authorities from all the 47 member states of the Council of Europe to organise public events to meet and engage with their citizens on issues of current interest. The aim is to promote and foster democratic participation at a local level. - taking part in a network of European municipalities and regions keen to improve local democracy in their place and across Europe. ELDW comes at an opportune time for Scotland as we have seen a gradual drift in services away from democratically elected councils to the centre. I set out this centralisation in more detail in a blog post last August. Police and fire reform, the Council Tax freeze, ring fencing funds, care integration and others all reflect a tendency from the Scottish Government towards centralisation. This is not a unique process to the current administration. Ministers usually come into office believing that services are best delivered locally, but as time goes on they become ever more centralist. In part out of frustration that what they want to happen isn't happening quickly enough. We should also not underestimate the role of senior civil servants who have never quite understood the difference between local administration and local government. Two Scottish think tanks published reports this summer on local democracy. Neither in my view quite hit the nail, although both are a useful contribution to the debate. We summarise both approaches in our 'Futures' magazine. ELDW also emphasises the importance of elected democracy - elected representatives, democratically accountable to their community. There is of course an important role for community groups and others in an active democracy, but they are not a substitute for democratic accountability. We should therefore be careful that initiatives like the Community Empowerment and Engagement Bill does not undermine local democracy. This year's ELDW is putting a focus on human rights in the context of austerity economics across Europe. Human rights are an integral part of local democracy. Many human rights and freedoms are implemented at local level, as is also the case with social and civil rights. These rights include protection and respect for elderly and disadvantaged people, children, minority groups as well as access to public services and freedom of assembly. Every citizen has a responsibility to protect human rights, while local authorities have a key role to play in ensuring that this concept becomes the foundation of a modern and cohesive community. Events like ELDW give us all an opportunity to recognise the importance of the local democracy we often take for granted. We should stand up for democratic accountability before the drive to centralisation swallows it up. Referendum sorted - what next? Today's news that the Scottish and UK governments have done a deal over the s30 order means that the debate can move on from the procedural to the substantive issues of constitutional change. While I would have liked the opportunity to work towards a second question, no one was under any illusion how difficult it was going to be work up a consensus option. A vote for 16 and 17 year olds is clearly right as they will have to live with the decision longer than the rest of us. Anyone who has canvassed on the doorstep knows that age does not define political awareness. The pivotal role for the Electoral Commission puts a strong independent oversight on the whole process. For those in the Better Together campaign a single question is welcome as they view this as a straightforward argument between independence, or separation as they put it, and what? For some in the Better Together campaign it is primarily the status quo as defined by the latest Scotland Act. For others, who support greater devolution, the challenge is to define a 'no' vote as a vote for a different constitutional settlement for Scotland. One advantage of the lengthy run in to the referendum is that it gives time to develop different approaches for Scotland. Independence won’t be defined until the Scottish Government publishes its White Paper in November 2013. The Liberal Democrats plan to publish their ideas soon and Scottish Labour's Devolution Commission will present an interim report to next April's party conference. Other groups have an important role to play in developing these options. It is particularly important to develop approaches that challenge the neo-liberal consensus that drives so much economic policy in Scotland and the UK. The RedPaper Collective seeks to do just that and expect more from us in the coming months. The key challenge is to move on from the mechanisms of independence or devolution and onto the purpose of constitutional change. The STUC have been doing this through the A Just Scotland initiative and UNISON, has recently agreed its For a Fairer Scotland vision following a consultation. These initiatives start a dialogue on what sort of Scotland we want and then measure the constitutional offerings against that vision.